I expected to enjoy this one more than I did. I think I’ve got a case of Discovery Channel Shark Special overdose. The shows chosen for this collection were all excellent and I remember enjoying every one of them when I saw them on TV but I just couldn’t get into them this time. I think that I might have channel surfed past them on TV unless there was nothing else on. I can’t really explain it. I don’t regret spending the money and I’ll probably watch them sometime when I’m more in the mood but if you catch yourself clicking past a shark show until next time then now probably isn’t the best time to watch this particular collection. They had some really good shows, Anatomy of a Shark Bite, American Shark, The World’s Deadliest Shark, Air Jaws, and others. 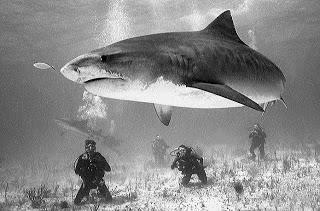 I think part of what I miss is some of the older Shark shows with people like Rodney Fox. These shows are more informative but the characters aren’t really there. Except for the one where they took retired shark fisherman Frank Mundus to South Africa to watch the leaping Great Whites. I find myself wishing that they’d included the Mythbusters JAWS episode and the Dirty Jobs with Mike Rowe episode where he looked into shark related jobs. It’s a good set, but it just didn’t give me the right fix this time. 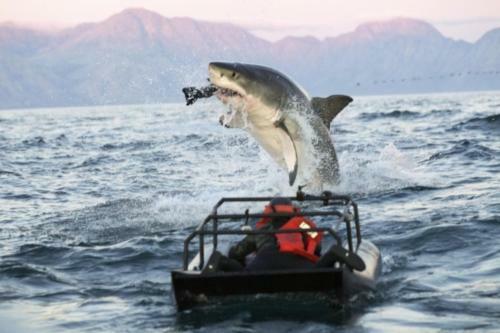 Ila France Porcher on this year’s "Shark Week" by the Discovery Channel.